EOTK get the lowdown on what happened! As hard hitting journalism goes, we’re not expecting a Pulitzer for this – but thought Liverpool fans would appreciate the story behind THAT Mo Salah banner! 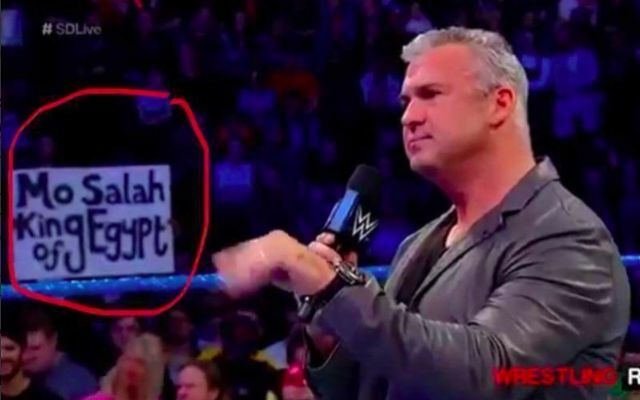 The other day, snaps from WWE went viral that showed a Liverpool fan holding a sign that read: Mo Salah: King of Egypt! It turns out though that Riaz had his banner confiscated on the strict instructions of WWE head honcho Vince McMahon (or so the security said…)! EOTK: So.. What made you come up with the idea? Riaz: First of all, because I’m on EOTK, I’d just like to take this opportunity to give a massive shoutout to Mo Salah’s Mum because she gave birth to an absolute legend. The idea was really last minute, I decided I wanted to take a sign for the event, and who better to promote than the King of Egypt? EOTK: Haha! I’m sure she’ll appreciate that… So what happened inside the Arena – I heard the banner got taken off you? Riaz: Yeah, so I was like every other person with a banner, putting it up whenever we could and stuff. A couple of Scousers two rows in front of me saw it and started laughing and we chanted ‘King of Egypt’ for a little while. Then about half way into the show, some lad with WWE uniform on poked me in the back and told me to give him the sign. I was like ‘What, why?’ He just told me to give him the sign because I wasn’t allowed it, so I gave it to him and asked the people around me why he took it off and they said that it was either a complaint from someone behind me, or that WWE didn’t want it in their TV shot. So after the main show I went over to him to get the sign back, (it took me and my friend the whole day to make). The dude made me promise not to put it up again. I asked him why they took it off me, and he said he got told to do so. I asked him if it was Vince McMahon and he said YES – so I was gassed! Nasty Vince McMahon banned Mo Salah banner! EOTK: Haha! Amazing.. I know who Vince is… So, did you see Salah stuck a picture of your banner in his Instagram story? EOTK: Haha.. Maybe… And just for good measure… Where do you think Liverpool will finish in the PL & CL this season? Riaz: I think the last 16 or maybe the quarters if we’re lucky in the draw for the Champions League. And for the league I’d say top 4 if we can keep our players fit. So there you have it, Reds. The story behind the best banner we’ve ever seen at WWE, which was banned by the Nasty Boss himself, Vince McMahon. We encourage any Liverpool fans attending any televised sporting event to do the same!